Hybrid cars are certainly making waves in the automotive industry and yet, can Infinity pull off a combination of luxury and functionality? Let’s take a closer look. Like other models produced by this brand, the Q50 is a comfortable ride. It can seat up to four people and ample headroom accentuates a rather spacious sense. Common amenities such as a GPS system, leather seats and a refined dashboard are all impressive. Still, these features are seen as being rather standard for a car of this class. The Q50 is equipped with numerous airbags including a rear body variant. As should be expected, it also offers four-wheel anti-lock brakes as well as a roll-over protection system. An innovative blind spot monitor is actually quite impressive, as there are fewer chances of drivers becoming involved in an accident while parking or changing lanes. Electronic stability control will help during poor weather conditions and integrated turn signal mirrors are other notable advancements. In terms of safety, the Q50 rates very high. A system known as Directed Adaptive Steering is intended to provide a smooth ride and yet, many drivers have claimed that it feels unsettling and even “fake”. As this hybrid is equipped with rear-wheel drive, changing speeds can be associated with a jumpy sensation. Another important point to mention is that all Q50 models (including diesel) tend to suffer from rather pronounced levels of body roll. Be prepared for some jitters around any tight turns during a country ride. Unfortunately, the Q50 loses many points in terms of its ease of use and handling. The main problem with owning an Infinity Q50 is the fact that upkeep costs are relatively high. This is then combined with a rather poor resale value and a lower mileage capacity when compared to some other high-end hybrids. When we consider that the average price tag will range from £29,000 to £48,000 pounds, many will ask if these drawbacks are worth such an investment. 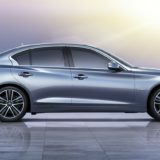 Although the Infinity Q50 scores high in terms of safety and creature comforts, the fact of the matter is that poor handling and a dismal resale value take away from what may have otherwise been a great hybrid car.